Margaret Spring is the Vice President of Conservation & Science and Chief Conservation Officer at the Monterey Bay Aquarium. 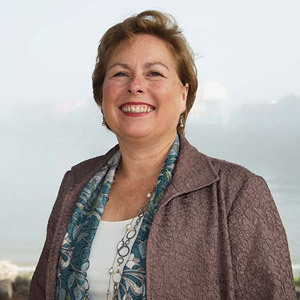 She oversees the aquarium’s Ocean Policy, Seafood Watch, and Conservation Research programs and their conservation priorities, which focus on conserving ocean wildlife and ecosystems, promoting global sustainable fisheries and aquaculture, and reducing the impacts of plastic pollution, climate change, and acidification on the ocean. Before joining the aquarium in 2013, she served at the National Oceanic and Atmospheric Administration (NOAA) from 2009 to 2013, first as Chief of Staff then as Principal Deputy Under Secretary for Oceans and Atmosphere. Spring had previously directed the coastal and marine program for The Nature Conservancy’s California chapter, and from 1999-2007 served as Senior Counsel (then General Counsel) to the Senate Committee on Commerce, Science, and Transportation, where she played an important role advising members of Congress on ocean issues and developing key ocean legislation, including the Oceans Act of 2000 and the Magnuson-Stevens Fishery Conservation and Management Reauthorization Act of 2006. She was appointed to the Ocean Studies Board of the National Research Council in March 2014. West coast and Alaska fisheries, for instance, stand out as strong examples of successful management in terms of reducing overfishing and rebuilding stocks. Having been involved in declaring the West Coast Groundfish Fishery an economic disaster and providing resources , she finds this change to be extremely gratifying. “It was an economically distressed fishery as well as being undermanaged (10:15)” she says, and she credits the quick turnaround time to establishing a system to a fishery that was previously neglected. Additionally, Margaret sees that fisheries managers have successfully moved forward in areas in which she and her colleagues struggled during the 2006 Reauthorization Act. Issues such as fish stock vulnerability to climate change and ocean acidification were “areas we knew were coming, and to see those things being meshed together in the report is great” (08:50). Because of the biological, community, and economic success stories that have been highlighted in NOAA’s past two reports, Margaret believes the U.S. is well-positioned to serve as an example to other countries managing fisheries. “U.S. fisheries are hardly in the red, only a few percentage-wise by weight. There are some areas for improvement but they’re moving in the right direction” (15:30). International fisheries are starkly different, and “are largely mismanaged” (06:00). She highlighted Pacific bluefin tuna as being “a terrible story of neglect and serial overfishing,” pointing out that “a reassessment of the stock showed unfished biomass is now down to 2.6% (i.e., the Pacific bluefin population has decreased 97.4% from unfished biomass – that’s down from 4.2% from a year or two ago” (06:16). This is largely because when compared to fisheries managed by other countries, the U.S. has a well-defined management structure in place. With that in mind, Margaret asks, “how do we take our leadership and our successes and tell those stories in other countries?” (12:00). For instance, the EU looked to the MSA when reforming their fisheries policy, and the management structure it provides could potentially be used by countries well-suited to take a leadership role, such as Japan in Asia. Looking to future management, “it’s always valuable to keep measuring your progress,” Margaret says. It allows managing bodies “to reflect upon what’s working and what still may need attention” (20:10). As climate and ocean conditions change, Margaret highlights the importance of considering predictive capabilities. “If fish stocks are going to change, how do you prepare for management around that change?” (21:45). This is one of the few government reports that serves as an indicator of ocean health and, ultimately, “fisheries are many things. Only a portion of it is the management. It’s all one system and everything has to evolve, and I think we’re in that process now” (17:15). While stocks have rebuilt on the west coast, New England, and the Gulf, catches have not rebuilt (i.e. catches have not increased along with increasing stocks). Why do you think this is the case? For example, demersal species in the northeast have rebuilt 5 times, but the catch has not gone up. Is it just a matter of time before we start seeing catch increases? What is your take on why this is occurring? As fishery scientists and managers know well, there are a lot of reasons catch might not increase immediately as stocks rebuild. They can be rooted in management, biology, economics and simple human nature – all are part of what makes up a “fishery”. One reason might be that catch is still restricted in order to allow the stock to continue rebuilding to the target level established by the scientific advice. Another might include a lack of market demand for the fish that creates no incentive for fishermen to harvest. In addition, managers could constrain fishing effort on a weaker stock in a stock complex during the period of rebuilding (a temporary situation). The important thing to remember is that decades of optimistic, overly flexible management decisions led to major fishery and fishing community declines. Managing fishing mortality is showing results and is working to reverse the results of serial overfishing. However, there is also a need to invest in science and technology innovation to support harvest decisions in a dynamic ocean environment. The U.S.’s hard learned lesson to focus on mortality reduction and enforceable limits is an important one for decisionmakers – especially in other countries – and RFMOs – to heed. Take for example, Pacific bluefin tuna, and the lack of accountability to scientific advice. We’ve developed research partnerships (see here) to try to bridge the gaps but more is needed and we will be working on it.